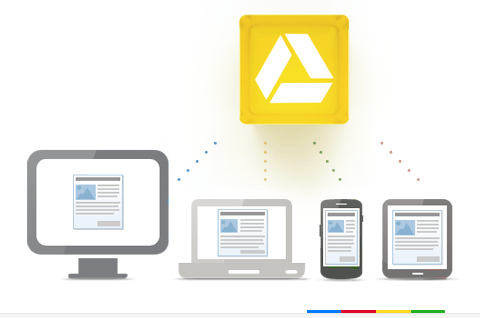 Much awaited cloud storage service Google Drive is now live giving free 5 GB storage to every subscriber. The service can be accessed at drive.google.com, though currently it is 'Not Ready' for me. Google Drive supports over 30 types of files and the storage can be upgraded to a maximum of 16TB. While Drive has clients for Windows, Mac and Android, no Linux desktop client has been made available at launch. 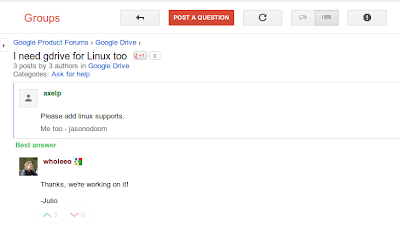 Linux users raised their voice on this and after observing a massive demand for it, Google employees finally said that they are working on a Linux client on official Google Drive Forums. Here, another confirmation straight from Google Drive Community Manager. 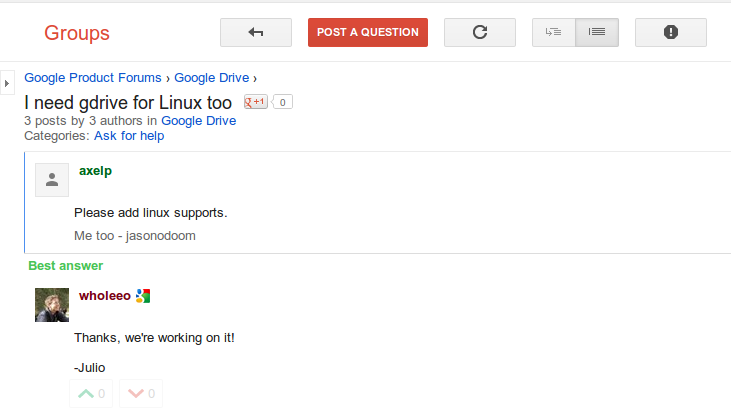 So, yes there will be a Linux client and it should be available soon for testing.